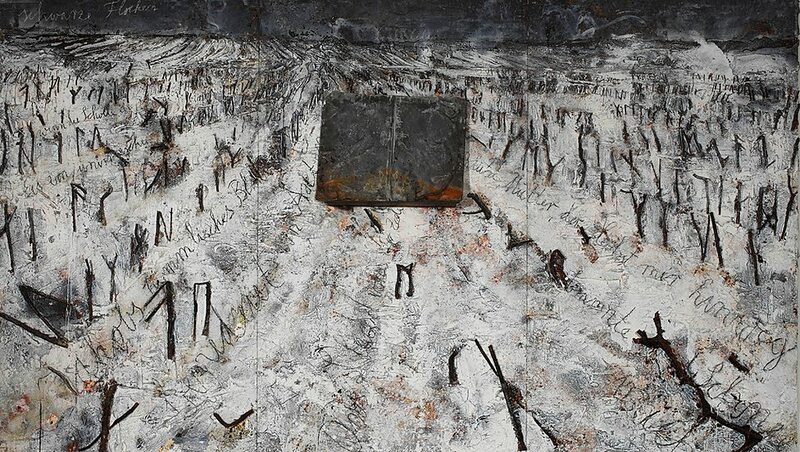 Visit the big retrospective of Anselm Kiefer in the Royal Academy and it’s unlikely that you’ll quickly forget it. Which is apt, because memory, personal and especially collective, is the big theme that runs through all his work since he began his career as an artist in 1969. For Kiefer memory is seldom direct or univalent. It’s an ambiguous function and its products are capable of simultaneous or even contradictory meanings. And just as memory can be erased or appropriated, as it was in Germany in the 1930s and 1940s, it can also be retrieved. Anselm Kiefer was born in the Black Forest just two months before the end of the Second World War. That war, or rather the deformation that the Nazi regime caused in the course of the history of his country, came to dominate the first phase of his artistic work. He first came to prominence with provocative performance works in which he portrayed himself giving a (banned) Nazi salute in various locations, like the river Rhine, that hold a special place in German history. They’re represented in the first room of the Royal Academy’s show by a large painting called Heroic symbol V (1970). 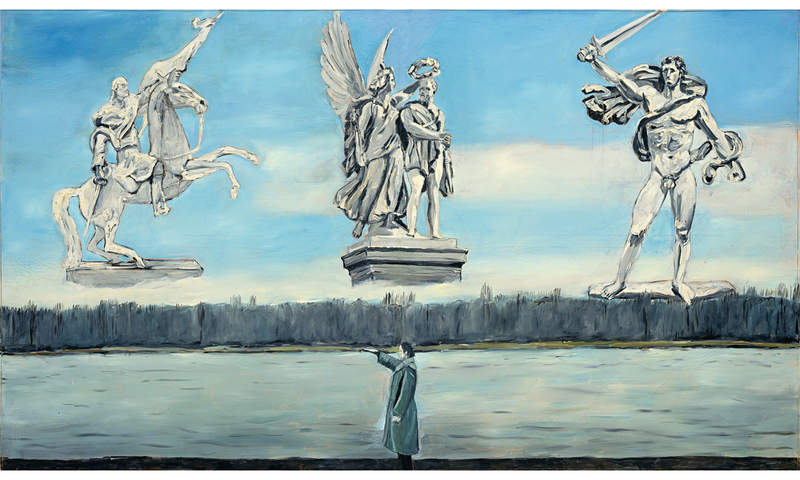 The small figure of the artist stands, saluting, against the broad river, with forest beyond, while above in the blue sky float three classical martial statues. Immediately, then, you’re faced with the aporia and confusion that become a common reaction to much of Kiefer’s work as you move from room to room. What’s going on here? What does the Nazi salute, which horrified contemporary critics in the early 1970s, signify? Is it a re-enactment intended to re-imagine the madness of the times? Is the artist/Nazi figure belittled and parodied by being overshadowed, literally, by the true heroes of German tradition? If so, why are they expressly militaristic in nature? I felt a similar sense of puzzlement in front of the ‘Attic series’, painted when Kiefer lived in an old wooden schoolhouse in Germany. These introduce several themes that run through much of the later work: the forest, a potent symbol in German culture, fire, a purifying as well as destructive force, and the Trinity (Kiefer is a Catholic). Some of these paintings also refer to the medieval stories of Parsifal and the Ring of the Nibelung, best known from the operas of Richard Wagner (the paintings have a stagey feel to them, though there are no people to be seen). Again, the notion of the ‘hero’ is under scrutiny. Are heroes still relevant in our world? Are they capable of resurrection and of reinterpretation? The questions continue when you get to the series of huge paintings Kiefer made in the 1980s of buildings designed for Hitler by Alfred Speer. 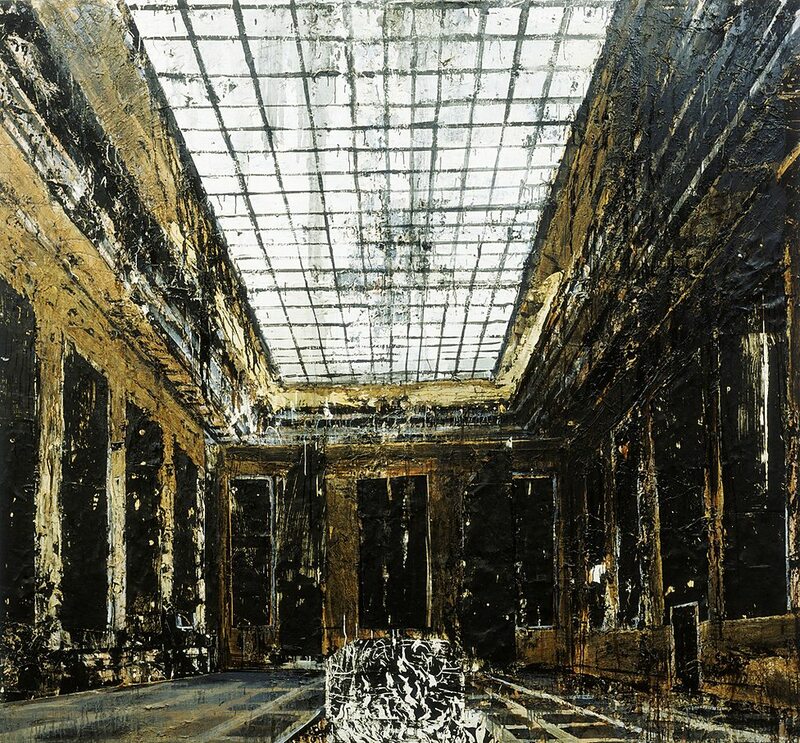 Interior (1981), probably Kiefer’s best known work, shows the Mosaic Hall of the new Reich Chancellery, part of Speer’s plan for a grandiose new Berlin, the capital of a greater Germany after the War. The building does not survive, but Kiefer restores it in paint: its gaunt pilasters and heavy architrave, its black walls, its cellular skylights. Or rather it’s a ghost of the interior, seen as if through a veil of ashes or dust. What is Kiefer’s intent? To retrieve neoclassical architecture from its theft by the Nazis? To add a new and ironic twist to the long western artistic tradition of the noble or picturesque ruin (Hitler seems to have foreseen that his new buildings would make fine ruins)? To warn of the false and dangerous attraction of the ‘romantic ruin’? Should we feel guilty about being impressed by, or even seeing as beautiful, a painting of a building that glorifies one of the vilest regimes in modern history? Kiefer’s 1980s interest in monumental structures extended to other cultures. Osiris and Isis shows a gigantic pyramid against a dark sky. Fixed to point above its summit is a circuit board, from which radiate wires ending in pottery fragments, a reference to the scattered body parts of Osiris in the Egyptian myth. Over time Kiefer’s paintings have become more and more sculptural, as objects, like straw, sunflowers and wire, become accreted to the paint surfaces. Some of the most direct and moving works here are inspired by the poems of the Romanian Jew Paul Celan, who unlike both his parents just escaped death in the camps – poems that question Adorno’s adage that all poetry was impossible and barbaric after the Holocaust. Black flakes (2006) shows a huge barren snow-covered field stretching almost to the horizon and punctuated by rows of twisted black twigs suggestive of grave markers. Incorporated at its centre is an inserted object, a lead book. 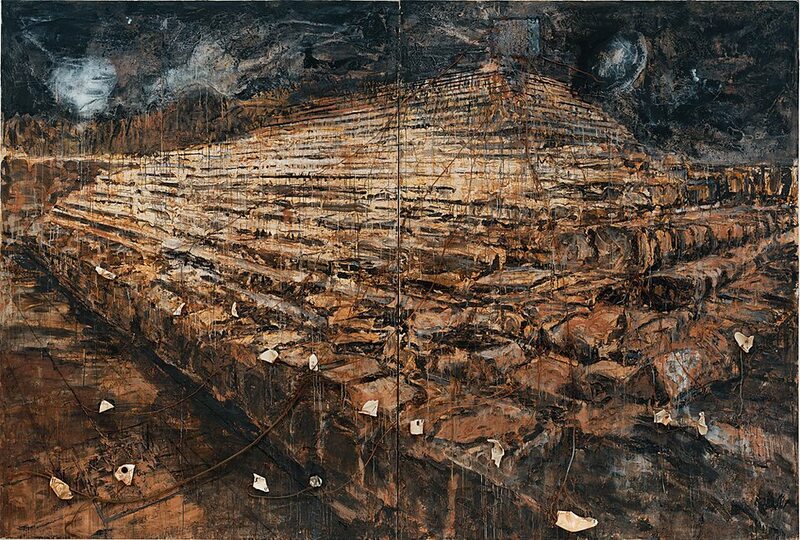 This may refer to the central importance of the holy book to the Jewish religion, but the book has a wider significance to Kiefer as a visual metaphor for human memory and the survival of our culture. He’s made many actual ‘books’, some of them made of lead, a material favoured for its weightiness and malleability (and apparently its role in alchemical transformation). And lead books feature as a central component in the recent sculpture, Language of the birds, the first work to greet you at the top of the stairs as you approach the exhibition. 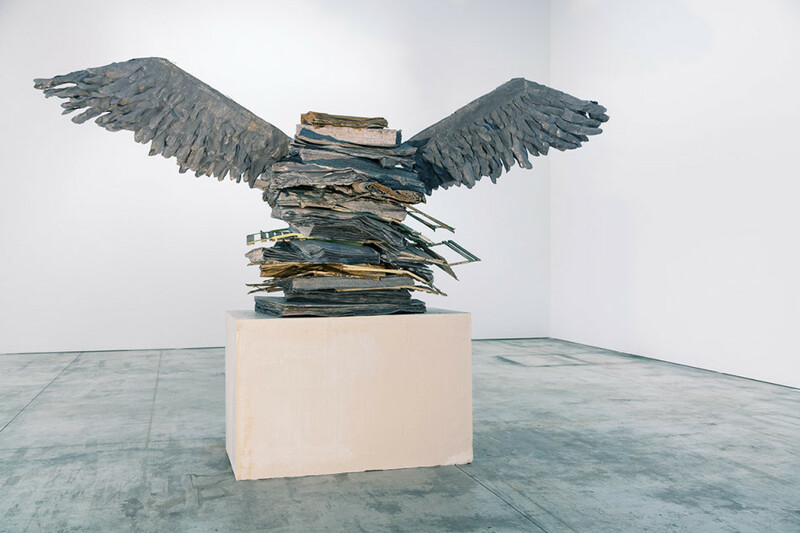 On a plinth a pile of lead books and metal folding chairs culminate in two enormous outspread eagle’s wings. The longer you circle this assemblage the more ambiguous it seems. 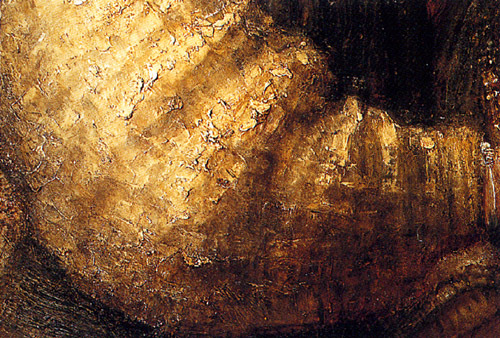 On the surface it seems to embody the triumph or even transcendence of knowledge and culture. Then doubts creep in. Lead is a strange material to use for flight. Don’t the raptor’s wings echo the symbols of imperial Germany and its destructive and oppressive state power? Again, the work is polyvalent, the response uncertain. Anselm Kiefer is an artist who works on a large scale – even his ‘books’ are elephant folios – and his themes are deadly serious. He’s no conceptualist: the works and the ideas are not distinguishable. It’s almost impossible to pass them by with indifference. His art contains so many possibilities and makes so many demands on the viewer that an exhibition like the Royal Academy’s is a challenging and draining experience. The main reservation I felt about the work was that it deals with human (and supernatural) themes at a collective level. What’s missing, with one exception (the artist himself), is the human individual. What it is to be human is for Kiefer a shared, almost abstract state. He doesn’t concern himself with the quiddity of the actual man or woman. For that you need to turn to the other unmissable London exhibition, of ‘late works’ by Rembrandt at the National Gallery. If Kiefer is still too little recognised in this country, you might think that Rembrandt is too well known. It’s too easy to take him for granted, to register his greatest works in a gallery and pass on without stopping to think why they’re great. There are other hindrances: we tend to find the secular works more to our taste than the religious, to prefer the apparently personal to the commissioned, the private works to the public. But the National Gallery show gives an unparalleled chance to see a selection of the very best of Rembrandt, from galleries across Europe and America, and to compare them. I wasn’t convinced by the National Gallery’s contention that there’s any such thing as a ‘late Rembrandt’ style. If you go and look at other, ‘early’ Rembrandts in the Gallery’s permanent collection, as I did, you’d be hard put to identify traces of a younger or ‘not fully mature’ Rembrandt. Reading direct from the life (bankruptcy and bereavement) into the work (more radical and expressive) is a questionable art historical practice. You can also safely ignore the Gallery’s labels used to sub-divide the exhibition – ‘inner conflict’, ‘reconciliation’ and the rest – which add little to the understanding. It’s the individual works that matter, and the chance to study them in depth (if you can, surrounded by mobs of audio-guided fellow-visitors). The first room brings together the late self-portraits, or rather all but one: for some reason the Kenwood portrait, Self-portrait with two circles, is placed in another. These would have made a fitting conclusion to the exhibition, rather than acting as its prelude. What’s striking about them is how different they are, mainly because, within a consistent formal matrix (frontal head, with beret or scarf), Rembrandt is deliberate trying out different expressions and moods, some more expressive than others. The Kenwood picture shows him at his least expressive and most stately; its famous ‘circles’ and its apparently unfinished state add to the effect of dignity and defiant self-belief. 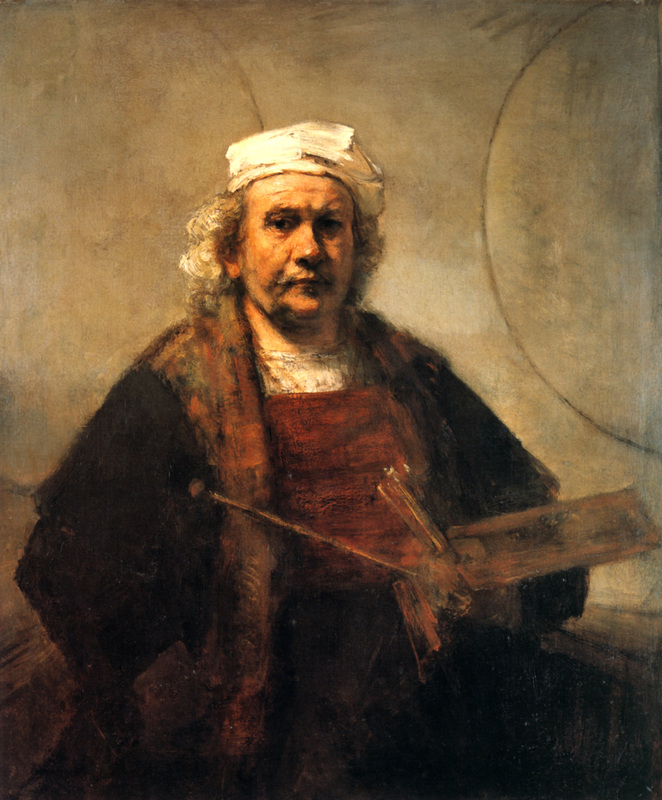 The self-portrait is the one area where the concentration on ‘lateness’ really works: Rembrandt has set aside any desire to impress or pose and is using the self-portrait single-mindedly as a tool of self-description and self-analysis. Even so, he’s not above laughing at himself: a tiny etching of 1658 in Paris shows Rembrandt in the course of etching: he has a sunken face that resembles a dumpling, fleshy and undifferentiated, topped by a felt cap. 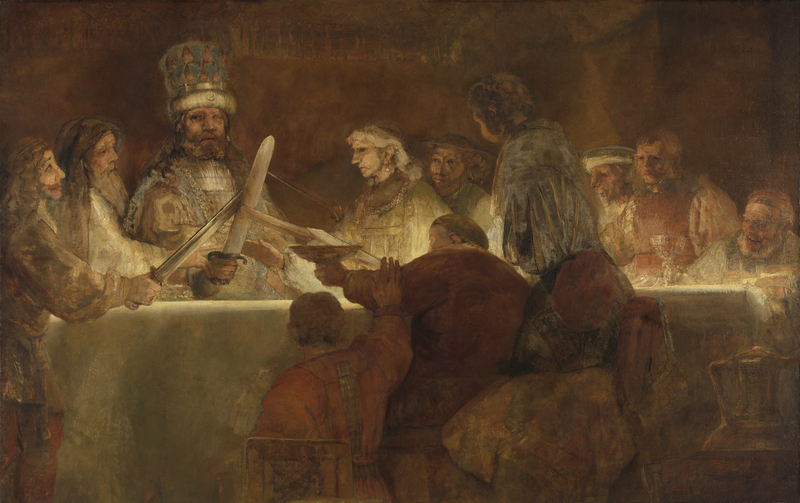 The star of the second room is The conspiracy of the Batavians under Claudius Civilis, a large painting commissioned for Amsterdam’s new Town Hall and intended to depict the foundation myth of the Dutch Republic. When the work was installed the city fathers rejected it, and it’s not hard to see why. This is no conventional history painting. For one thing the scene, a long table where Claudius and his fellow Batavian rebels against the Romans swear their oath, is theatrically lit by lamps on the table hidden from view by figures who have their backs towards us. Then again, the characters are a mixed bunch. Rather than heroic first century Germanic tribesmen they resemble a random collection of contemporary Amsterdamers Rembrandt has lured from the street into his studio. The aged Claudius, wearing a Rastafarian hat, stares ahead with his one sighted eye and holds aloft, with some effort, his weighty sword, while a ragged militia, including several Dad’s Army members, give their assent, without wholesale enthusiasm. This lot are no match, one would imagine, for hardened Roman legionaries. The whole picture has the appearance of a cartoon. It would be interesting to hear an interview with the artist about his concept for it. 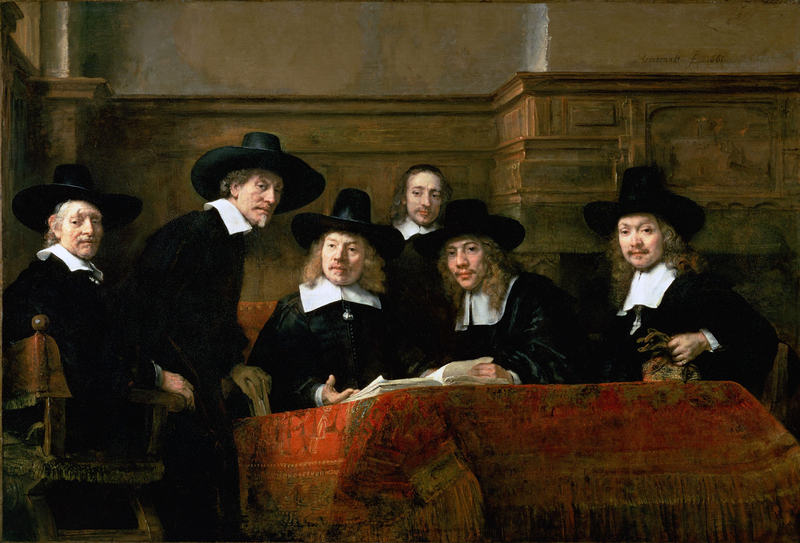 Rembrandt seems to have been much more fully engaged with another group gathered around a table, The sampling officials of the Amsterdam Drapers’ Guild, known as The Syndics (1662), even though the occasion, a routine business meeting, is much less dramatic than the beginning of an armed rebellion. The five officials, whom we would call quality controllers, look calmly towards us. They’re dressed alike, very plainly, with dark cloaks and hats and broad white collars. They take their duties seriously. The focus of their attention is a book on the table in front of them (our viewpoint is below the level of the table). The book probably isn’t a bible, but it could be, so serious is the mood. The second official rises from his chair, as if the artist is a candidate who’s just arrived for a job interview. Critics have drawn attention to Rembrandt’s masterly composition of the figures, all the more impressive because this is a democratic group, without obvious hierarchical differences of use to a painter. What Rembrandt is celebrating is a whole Dutch culture, now perhaps beginning to pass: one that placed a premium on a civic life plainly lived, on civic duties carefully performed, on civility in general. 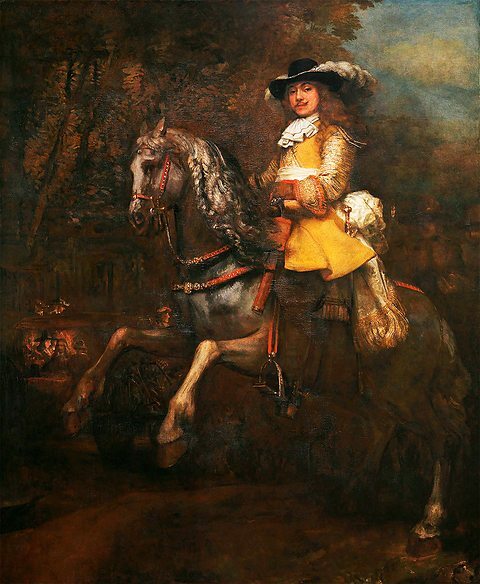 Very different is the Portrait of Frederik Rihel on horseback (c1663). This is, according to the National Gallery, ‘one of just two life-sized equestrian portraits of Dutch citizens painted in the 17th century’. Here’s a man who thinks he sits above his fellow-citizens, socially and literally. He’s a show-off, with his haughty look, twirly moustache, fancy costume and hat, and advanced horse-riding skills. It’s interesting that on the left side, barely visible in the gloom, is a small group of ordinary people, ignoring the grandee. You feel that this work, for the artist, is a commission at the most superficial, monetary level – very different from the Syndics, or the Gallery’s own portrait of Margaretha de Geer and her dead husband, works of profound understanding and sympathy. Another portrait into which Rembrandt invested much of himself was that of his young son Titus (1655). It’s unusual for this artist because it borrows the format of a trompe l’oeil painting. Titus sits behind his school desk. His left hand, an inkpot and a writing case project over the top of the desk, breaking into our own space. It’s not this device, though, that takes the eye, but rather the figure of Titus himself. Instead of concentrating on his writing he’s staring into space with a wide-eyed dreaminess. 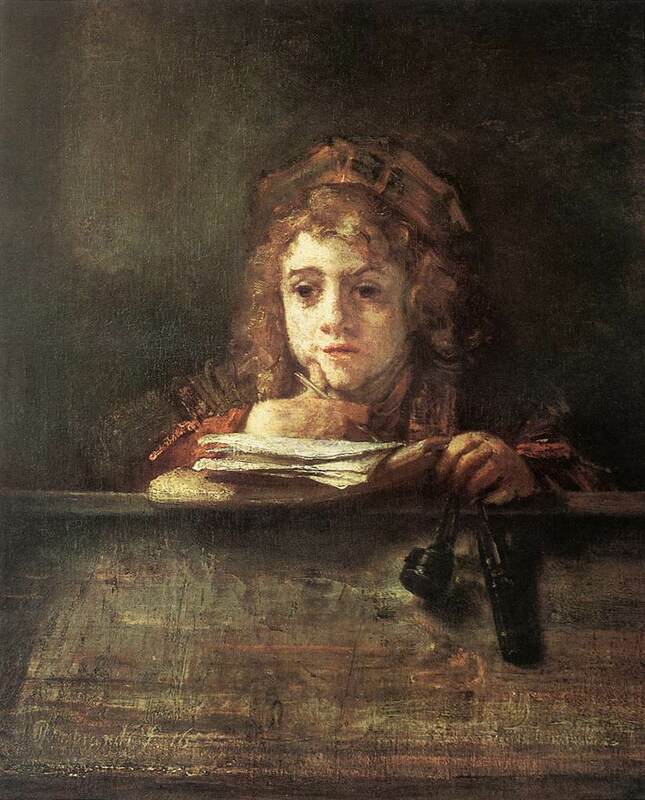 This picture of inattention, and a small detail – Titus presses the thumb of the hand in which he holds his pen into the bottom of his cheek – let us leap the centuries that divide a seventeenth century child and any child we might know today. 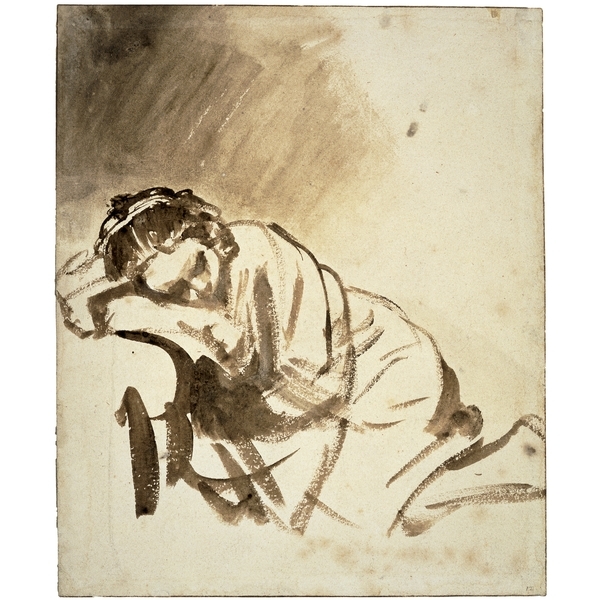 A small study (brush and brown wash) of similar tenderness from the British Museum shows another of Rembrandt’s family, his partner Hendrickje Stoffels (if it is she), sleeping, her head resting on an arm. This completely informal and momentary sketch is a miracle of economy, as the catalogue says, ‘reminiscent of Eastern calligraphy’. The picture in the exhibition through which Rembrandt speaks most plainly to us about what it is to be human, it seems to me, is the painting conventionally (but for no good reason) called The Jewish bride, on loan from the Rijksmuseum. No wonder this is where the largest crowd of gallery visitors congregated. The man and the woman are sometimes identified as Isaac and Rebecca, Old Testament exemplars of mutual love and adoration, but it hardly matters. They’re two very real individuals. The man, the taller of the two, embraces the woman’s left shoulder with his left hand and places his right hand – large, flat and outstretched – against her breast. She touches the lower part of his right hand with her left, while her right hand is lower, placed over her red dress. It’s these simple but meticulously arranged gestures more than anything else that convey the emotional closeness between the two. (Their contemplative faces lack strong expression, and their eyes gaze not at each other, but sideways and downwards, the direction of one crossing that of the other.) Their open hands signify the ingenuous, unreserved nature of the lovers’ relationship. The double touch – hand on heart, hand on hand – acts as a clasp or lock upon it. The couple wear ‘best clothes’. 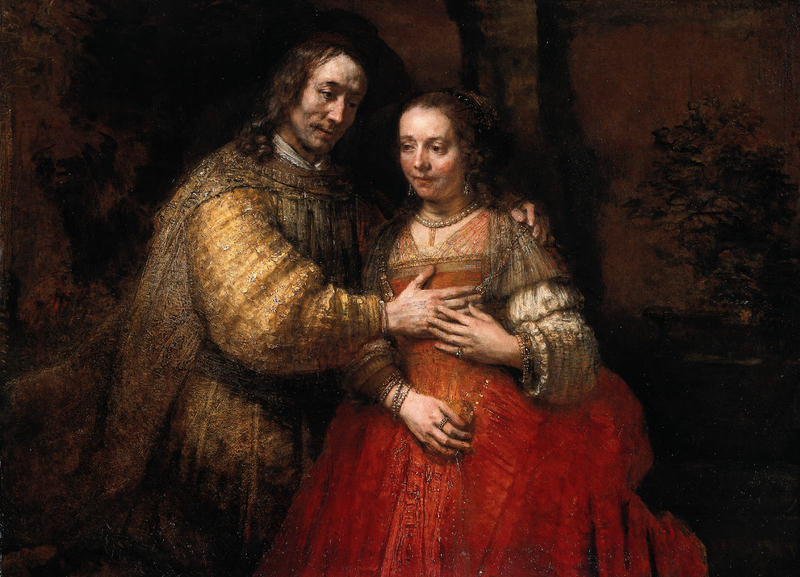 His tunic and her dress are deliberately ‘inflated’ to give Rembrandt the broadest canvas on which to lavish all his accumulated skill in painting textile surfaces. As many have commented, the yellow sleeve and the red dress below the woman’s right hand are among the finest passages of paint in seventeenth century art. 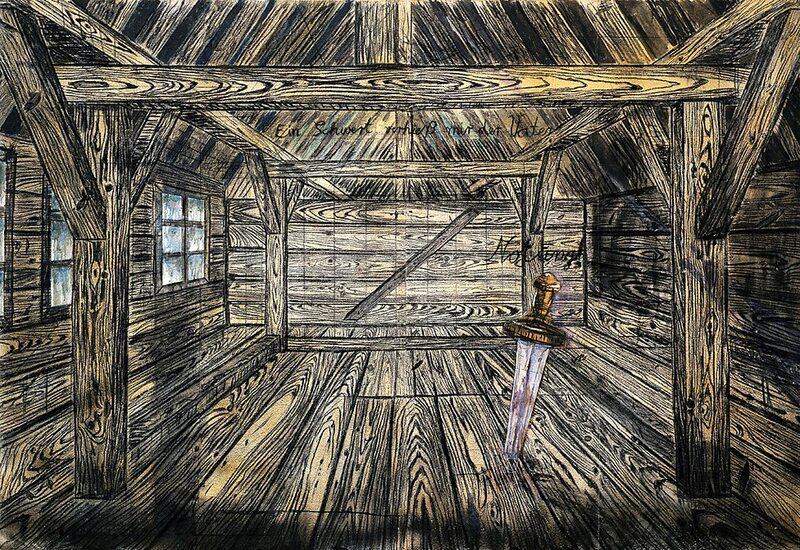 Anselm Kiefer’s use of real diamonds to mirror the splendour of the stars in one of his paintings seems cheap and meretricious in comparison with the flashes, glisters and gleams Rembrandt achieves on his yellow sleeve with the help of no more than impasted paint fragments. One thing I noticed about the painting that I hadn’t spotted when I saw it in the Rijksmuseum was that the scene is not, as it might look at first sight, an indoor one. The background is dim, but the two figures are standing in the open air. Behind them is a bench, a plant and some simple architectural detail (a pilaster framing an alcove?). So this manifestation of mutual love is, potentially at least, a public and not a private event. The two are content for their self-revelation to be witnessed by others. Maybe we’re participating as honoured guests in the wedding reception, if these are indeed bride and groom? Very good article. Insightful and fantastic to read back years later. They were both fantastic shows, Kiefer in particularly had me deep in thought for weeks!